The cruise itself was OK. We went to tour the Christmas markets which have largely lost their charm - lots of the same junk you can buy at home. The tours were OK, but we found we had much more fun going out on our own. Sightseeing in some of the less traveled stops such as Durnstein was extrordinarily fun and interesting. 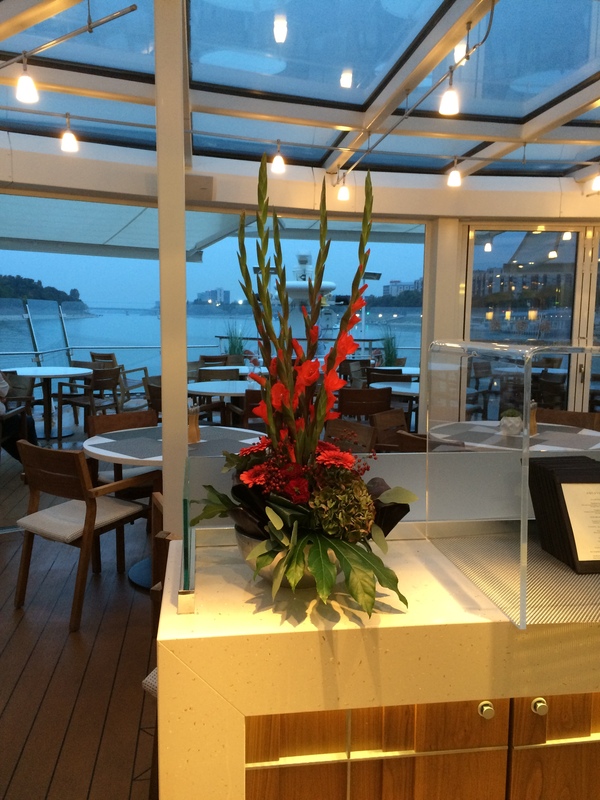 The standout onboard was the dining staff - wonderfully nice and accomodating. Decent food, outstanding soups. Sadly lacking was the concierge/cruise director bunch. Cold as ice, unfriendly and completely useless whether it was asking for a reservation at the baths in Budapest, or trying to get us home at a reasonable hour. Oh, the air travel... unless you want to spend the first day of your cruise in bed sleeping, book your own airfare. We were delighted to save a bit of cash on flights until we found out why. It took us 23 hours to get from Charlotte to Budapest. You see, when you sign up for their air, they book you on one of the routes they have pre-purchased. The flight they sent on our initial itinerary was not a "real flight", but an example of a flight. When we got our actual booking, we found that we were being routed through Chicago which included a 9 hour layover. I called and asked to have the flight changed and was told I would have to purchase the "flexible" travel plan, $50 per person, that would allow us to make changes to the flights up until the time of departure. We were then booked on another boondoggle and asked to change it when we were told, "Your tickets have been booked and there are no changes allowed." So much for the "flexible travel" plan! When we arrived, we heard other similar stories, like a woman and her 93 year old mother from Boston whose journey took 35 hours to complete. That's simply ridiculous not to mention inhumane. Our trip home required that we leave at 3am in order to catch our morning flight. We were told to work with the concierge on the boat if we wanted to change it. We started working on that the moment we got on the boat. First response was "impossible", but when we asked to escalate, we were told they were "working on it". We asked every day; every day, they were "working on it". Finally, we were told 2 days before departure that they had found a later flight which would allow us to depart at 8am. And it was $775 per person to change. In retrospect, it was stupid to make the change, not only because of the $$, but because nearly everyone else on the boat had been booked on an early flight. By 3am, it was so loud, we got up. Clearly, they want you gone so they can begin prepping for the next load. The cruise director rode to the airport with us. When one of the ladies asked him for help with her bag, he said "You're on your own now. Cruise is over." He sat two rows in front of us and openly complained about the people on the trip. Very professional. As it turned out, our flight from DC to Charlotte did not provide enough time to get through customs, and we missed the connection so we had to stay overnight in DC. We had a housesitter staying with our dogs and horses who had already left the house that morning. He agreed to return late that evening , since he had other plans. When he arrived, our dogs were so worked up having been left alone for 12 hours that they ran into the street and one of them was killed. How about that for a nice finale for a vacation? I don't generally complain since it doesn't really get you anywhere... but this time I did. I called their customer service line and was eventually asked, "What are we supposed to do about it? We can't bring your dog back to life." Interestingly, I got a survey in the mail from Viking that week, so I filled it out. About two weeks later, I received a call from a very nice woman who seemed genuinely concerned. She offered to give me $800 towards my next cruise. I thanked her for her offer, but told her I wouldn't be returning. That was actually the first sign of humanity I had seen from Viking other than their kitchen staff. Out of respect for the kitchen and wait staff, I give this two stars. Everything else gets a 1 or 0. It was consistently kept clean and presented a friendly\, welcoming atmostphere. This was the ships third cruise since new\, so that was very nice. The crew was very pleasant and could not do enough for you. The cruise director kept things lively and he monitored all activities to make sure it was going OK!